Voila!! Pulled Pork un-pulled. (click to enlarge images. Are any of you old enough to remember the shallow red painted pans that sat on flimsy tripods of aluminum legs and along with 5 pounds of charcoal briquettes and a pint of starter fluid, sold for 15 or $20 just about anywhere and whose purchase signaled the beginning of spring and the barbecue season? Cedar chips, chef hats, aprons, thermostats and expensive full-color coffee table barbecuing books soon followed. All of this was meant to improve the image if not the food of the middle class captain of backyard Barbies. But alas, the world has turned once more and things ain’t as simple as they used to be. Welcome the Green Egg. A 145 pound behemoth whose lid requires a forklift to raise and whose temperature tops out at 800°F . The large size Green Egg, there’s an extra large, will set you back over $1000 and that’s before you find a way to hold it upright and accessible. And you can no longer burn charcoal briquettes, they are carcinogenic, you must purchase lump charcoal.. But if joining the latest culinary queue is your bag, some very special treats await. I know whereof I speak. My son Bryce has a Green Egg (large size) and he knows how to use it to advantage. I have tasted his Green Egg steaks, prime ribs and his crème de la crème pulled pork. Even without the Green Egg he’s a terrific cook and much to the delight of family, and friends, the Egg has provided him with experimental opportunities that satisfy his natural inquisitiveness for things technological as well as culinary. First, a little background. A few years ago Bryce and his wife Jill bought the house next door, gutted it and extended it by adding a huge kitchen, with an eight burner gas stove, a large living room and upstairs, a master bed room en suite with hot tub. Bryce built a sound system capable of providing each room with its own music and individualized ambience. 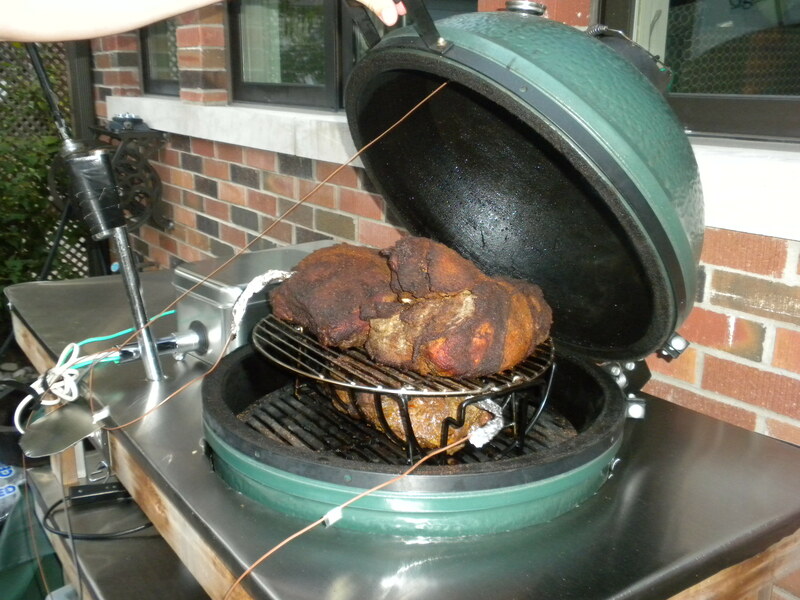 Also, the entire house is on the network and this point is crucial to his Green Egg pièce de résistance, pulled pork. A properly cooked pulled pork requires up to 30 hours of cooking with variable temperatures. My son is a busy executive and without modern technology, his pulled pork recipe would be beyond him. So send in the Internet, computers, Wi-Fi and Twitter. First Bryce purchased a Stoker. 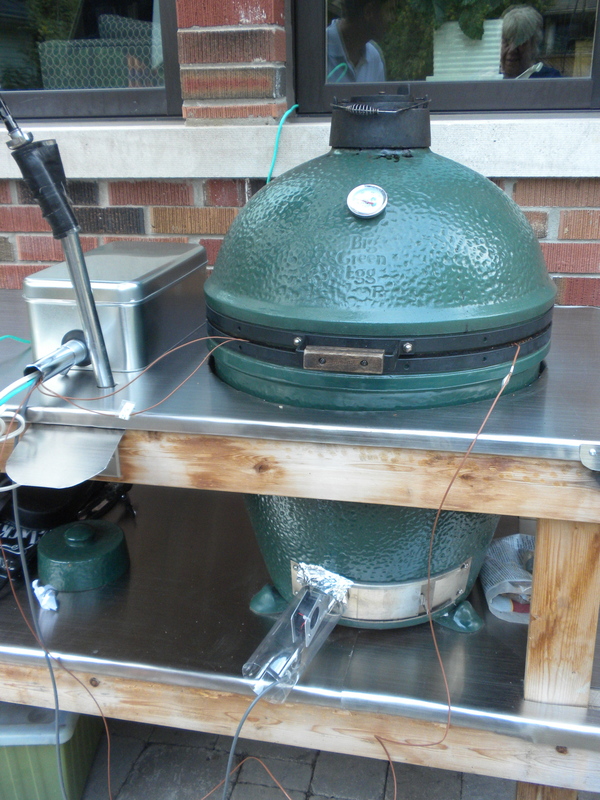 The Stoker controls the Egg’s internal temperature by pumping air into the vents of the Egg. The more air, the higher the temperature. The Stoker measures the internal temperature of the Egg and sends a signal back to the control unit in the stoker which then signals the fan to increase or decrease its speed. 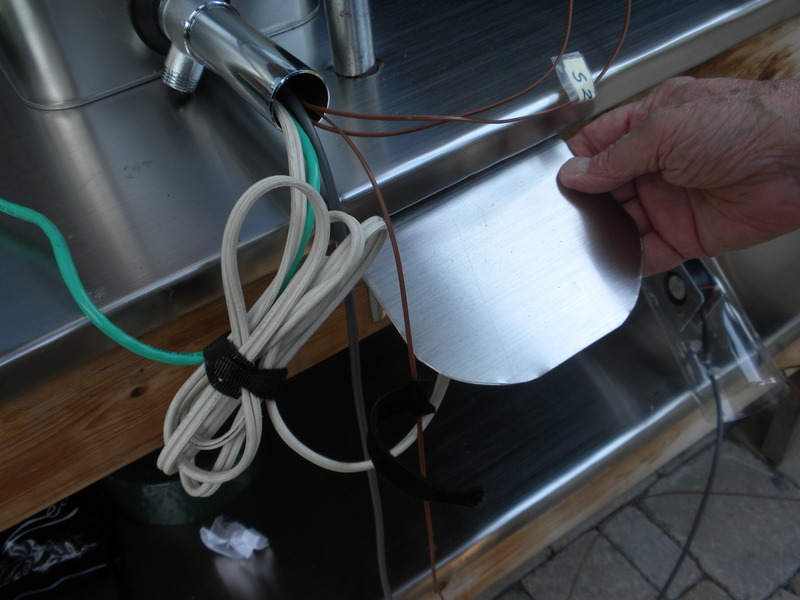 There are also probes that measure the internal temperature of the meat. Bryce then connected his stoker to his home network. 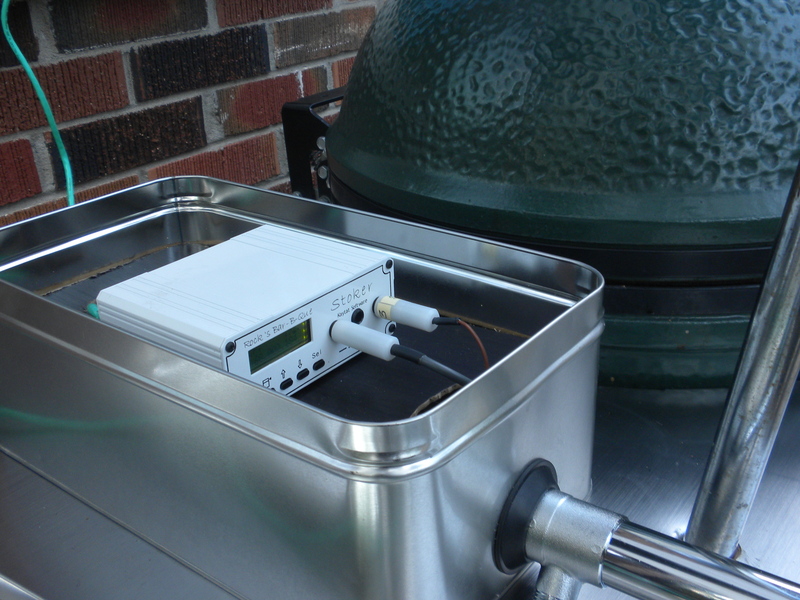 This allows him to monitor and control his BBQ remotely. He also set his unit to send him Twits to his Twitter account so he is able to monitor the cooking situation from anywhere. The Green Egg. w: Fan at base. Thus he can begin a pulled pork weekend on Thursday evening. At work on Friday he can Monitor the temperature, making necessary and sometimes minute adjustments from his office to maintain a constant cooking temperature of 200 F.
When my wife Eleanor, a particularly rabid fan of pulled pork, tasted Bryces’s completed confection, there was silence. Then followed an Ohhh of ecstatic dimensions only a Mother and pulled pork aficionado could produce. As a product of the rotary phone era, I appreciate having my son nearby.